His first app launched tonight: Quip for iOS (plus a preview version for Android), is a collaborative document editor. “The transition from PC to phones and tablets is so significant that all the software is going to change dramatically,” Taylor posited in a phone interview. Previous attempts to improve productivity software have wilted in Microsoft’s shadow — and to a somewhat lesser extent are now dwarfed by Google Docs — but Taylor thinks mobile might be the opening. “There could be an opportunity for a company of our size to compete in this space for the first time in 30 years,” he said. Taylor, who helped start Google Maps and saw his FriendFeed social aggregation app acquired by Facebook, left Facebook last summer. He started Quip with his former Google co-worker Kevin Gibbs, who was instrumental in creating Google App Engine and Google Suggest. The company has raised $15 million from Benchmark Capital, led by Peter Fenton, along with Greylock Capital, Marc Benioff, Yuri Milner and Ron Conway. It has 12 employees and is based in San Francisco. 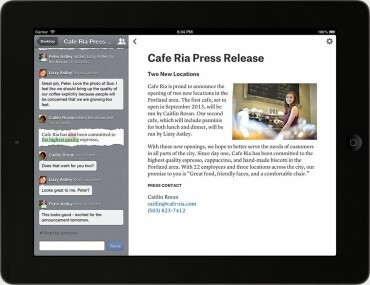 Quip is built to be “free-form,” Taylor said. It doesn’t have all the features a traditional word processor would. It does have some novel additions, like a checklist that could be used for a shared shopping list or for product management. And when people make changes to a document, they’re noted as part of a chat conversation, with everyone involved. “It’s almost like a shared whiteboard, and not just a piece of paper anymore,” Taylor said. But that begs the question, how compatible are Quip documents with existing tools, like Microsoft Word and Google Docs? And the answer is, not very. Quip users can export to PDF, and “import” from other documents by copying and pasting with the formatting preserved. That’s bound to be a major obstacle to convincing people to give Quip a try. “Compatibility is becoming as much of a legacy as an asset,” Taylor argued. (Translation: Legacy equals bad.) “In our testing, a lot of folks talked about how they now export everything into PDFs to send it out, because people can’t read Word documents on their phones. So, how is the Quip experience different from FriendFeed and Taylor’s other projects at Google and Facebook?